Neutral light brown tones make this spacious chair and a half with ottoman a refreshing addition to your living room decor. 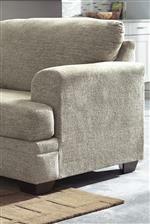 Flared arms, a t-style seat cushion, and one square accent pillow add cool style to the chair's contemporary look. The Barrish Contemporary Chair and a Half & Ottoman by Benchcraft at Walker's Furniture in the Spokane, Kennewick, Tri-Cities, Wenatchee, Coeur D’Alene, Yakima, Walla Walla, Umatilla, Moses Lake area. Product availability may vary. Contact us for the most current availability on this product.